Julie Brown, program director for Portland State University’s Bilingual Teacher Pathway program, recalls how she first got started in bilingual education. With an undergraduate degree in music therapy and a master’s in special education, Julie is currently completing her doctorate in special education. She always knew that she wanted to work with students with special challenges. She started out teaching special education in southern California. When she changed school districts, she was hired to teach a bilingual kindergarten class. “I taught little kids that came from the barrio where my grandparents are from, in north San Diego County. Because I grew up in the area, they thought I would make a great bilingual teacher,” said Julie, a third-generation Mexican-American. Combined with her formal training in special education, Julie’s passion for helping students who are English language learners (ELL) blossomed. Fifteen years ago, she created a bilingual special education classroom for kids with disabilities who spoke Spanish. 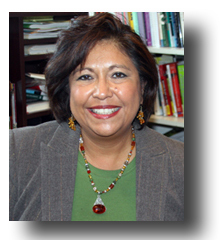 Since 1999, she has been directing PSU’s Bilingual Pathway Program. Creating a pipeline of bilingual teachers in local school districts is the main thrust of the program. Bilingual and bicultural instructional assistants in partner school districts are eligible to apply to the program. In the past, students have received tuition stipends through grants from the federal Office of English Language Acquisition. At this time there are no funds for student support. “The school districts do most of the recruitment for the program. They encourage instructional assistants who show talent and potential to apply to the program. Even though there is currently no tuition support, our yearly cohorts continue to be full and there is great interest from students and districts for BTP” says Julie. At the end of the program, participants are employed as teachers, usually in the school district where they are already working. Thus far, the program has graduated about 185 teachers. “It’s really hard work to make the program successful. Our students are working full-time, and a little bit older than the average student going into teacher education. Many have families, and a lot are foreign students. It takes a lot of attention to help them navigate the system. We have four staff members work with about 50-60 students we have each year. Through BTP, our students are able to realize their goal of being a teacher,” she said. In a Q&A with Colors of Influence, Julie talks in more depth about her work and how the program is making quality education accessible to all students. Why should general public care about bilingual education? If you look at demographic changes in Oregon over the last 10 years, it’s obvious that our population is rapidly becoming more diverse. Therefore, impact the schools. In order for a society to thrive, it’s important to have an educated populace. It’s important that we help every student to realize their potential, no matter where they started from or their legal status. We need to know how to educate all students. The bilingual population is newer here in the Northwest, because we haven’t had the diversity that Sunbelt states have had for years. States like California, Florida and Texas have had bilingual education for a longer period of time. Their experiences have helped us see what works. School districts are realizing that we need to diversify the teaching workforce with people that both look like its students, and people that speak the languages of its students. In Portland Public Schools alone, students speak 70 different languages. It’s hard to find teachers that speak all those languages, but it is important to try. This program is only one solution to the problem of finding bilingual staff, but it is a very viable solution. Some districts have tried recruiting bilingual teachers from other states, but they’re not from our community. Often, they’re from sunny climates. After they’ve gone through a couple of Oregon winters, they may not stay around. They also may not necessarily have the buy-in from the community. When we grow our own teachers here, we have people who already have strong roots within the community, and may even have children going to school in the district where they work. We know they’re going to be here for the long term, to advance their careers. We know that they are going to stay to make a difference in our community. What trends do you see in bilingual education? The exciting thing about being in Oregon is that there are more and more dual language programs. Students are getting instruction in their native language – mostly Spanish – and in English. That way, you’re building the necessary strong foundation in their native language and focusing on their English development in order for the students to be truly bilingual with equal language abilities. This brings up an interesting trend. We need more bilingual and fluent teachers who have the ability to teach in both languages. There are a couple of issues around that: our state only requires the Praxis standardized language exam in order to get a bilingual endorsement. In other states, teachers are required to take classes on learning how to teach biliteracy, how you teach Spanish reading, and other courses that would really help with the pedagogy of bilingual education. We don’t require that here, and therefore we have people in dual language programs that are learning from the ground up. I’d like to begin to develop some of these types of courses, perhaps calling on the expertise of some of our graduates. The other challenge is finding enough bilingual teachers and providing professional development opportunities in our region to help them to develop their Spanish to high academic levels. For example, teaching science in Spanish to middle and high school students requires a very specialized vocabulary, technical language and academic Spanish skills. What I’m working on right now is working with the Universite Autonoma of Guadalajara to be able to take our alumni and students for a summer program in Mexico to help them increase their academic Spanish. Why is it important to have teachers in the classroom who look like students? It’s critical for children to see that their dreams can be realized. I didn’t know anything about going to college; neither did my parents. It’s important to have people in our schools who understand the kids’ cultural backgrounds, and the kinds of support the kids need. It’s important that children have people who are really supportive, who can help them make good choices and help them navigate the system. What accomplishments make you most proud? We’re most proud of our 185 graduates. We have teachers out there who are advocates for ELL students. Some of them have gone back to graduate school, and others have assumed leadership roles in education. One of our former students is the director of migrant education for Northwest Regional ESD. We now have former students who are in positions of authority who can help develop this field. We try to keep our professional network connected. Our students come from all over the world and speak 16 different languages. I continue to write grants to help support nontraditional students become teachers. We have received over $2 million in two new grants in the past year that will allow us to develop culturally competent early intervention special education teachers who serve kids from birth to 5 and bilingual special educators in K-12. Our goal is to assist educators in differentiating ELL and other minority students who are struggling academically because of language differences from those who have true disabilities. These programs will help us be able to deliver appropriate instruction/intervention to every age range of ELL children in special and regular education. The best part of my work is our students. I feel so lucky to be part of creating new structures to develop teachers who have the advocacy hearts and the competencies to meet the demands of our population. When I hear of success stories in the classrooms, how they are making a difference, and the way they can break through to a certain child or work with a family - that’s magic. "In Portland Public Schools alone, students speak 70 different languages." "When we grow our own teachers here, we have people who already have strong roots within the community." "It’s important to have people in our schools who understand the kids’ cultural backgrounds, and the kinds of support the kids need."